A plain, simple, churchy looking building dating from 1950. It was formerly known as St Anne’s Episcopal Church (see below). The interior is simple but pleasant, with blue carpeting and beige and brown walls, and some nice stained glass. The wooden versus populum altar is on a raised platform. It is easy to spot where the old ad orientem altar used to be, as the tabernacle is still there and is still in use. 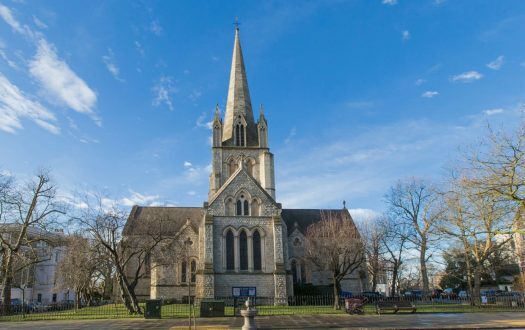 The congregation was formed in 2006 by a majority of the parishioners at St Anne's who voted to leave the Episcopal Church. 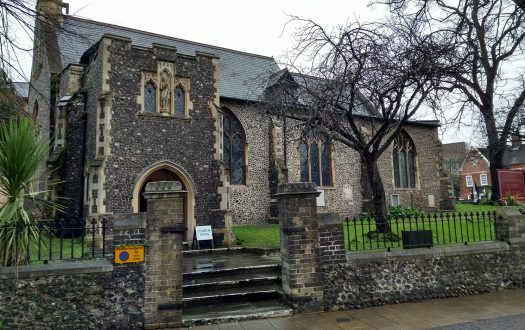 They claimed the St Anne's building for themselves and expelled that portion of the congregation who had voted to remain Episcopalian. A lawsuit ensued, and in 2010 a settlement was reached whereby the majority group would return the building to the Episcopalians. Adopting the name Grace Church, the majority group leased space in a nearby corporate park. 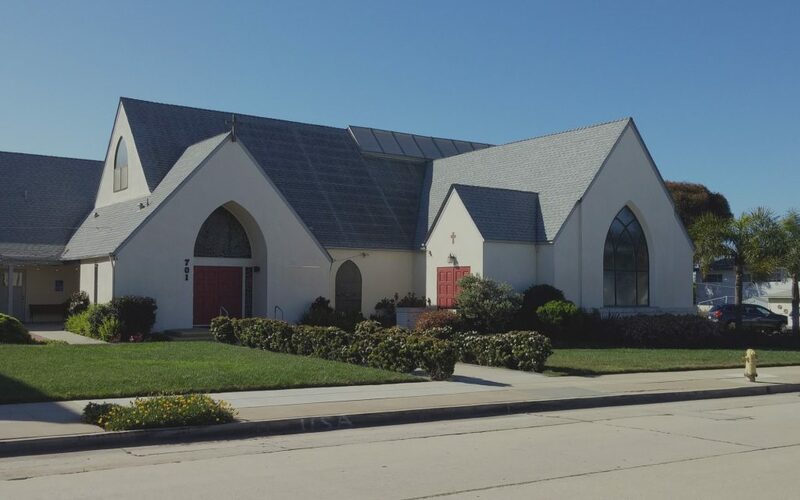 Ironically, St Anne's parish was dissolved in 2016 by the Diocese of San Diego due to dwindling membership and negative cash flow, and Grace Church has now reoccupied the abandoned St Anne's building. They sponsor men's and women's ministries, and small group meetings for Bible study, prayer and fellowship. There are three celebrations of the eucharist each Sunday: an early said traditional service, a later contemporary family service, and an evening service in Spanish. Oceanside, on California’s Pacific coast about 60 miles north of San Diego, is home to the Camp Pendleton Marine Corps base, and both the military and the tourist trade loom large in the city’s economy. As one travels south from downtown, however, these influences are felt less and less. The church is located on West Street just off the Coast Highway, the main north-south drag through town. They are very near the Coast Highway stop on the Sprinter light rail line, and the Nos. 101 and 302 buses also stop at West Street. Clean-scrubbed working class housing predominates on West Street, and the Coast Highway in this section of town is marked by used car dealerships, diners, and miscellaneous shops of one kind or another. Nothing particularly remarkable, unless you are a railroad buff (which I am) and find the Sprinter line intriguing (which I do). The pastor, assisted by three adult gentlemen, all vested in cassock-alb. In addition, the pastor wore a red stole and donned a red chasuble at the offertory. The others wore no stoles, so I could not tell if they were clergy or laymen. I will assume that at least one of them was clergy, as both he and the pastor wore black slacks and black shoes under their albs. The others wore blue jeans and brown suede casual shoes (one) or hiking boots (the other). Hiking boots! Miss Amanda regretted leaving her smelling salts back at the hotel, but she could hear the Baby Jesus and his Blessed Mother weeping all through the service. At least his red bootlaces were the liturgically correct color for Palm Sunday. Combined Palm Sunday Eucharist. Neither their website nor signage outside the church mentioned that the usual early and family services would be combined into one. I was glad at least that I had showed up at the right time. I counted about 100 chairs in the nave. There were pews in both transepts, but I could not see into the transepts well enough to count them. In all, there were about 50 people present. Quite a few sat in the transepts. The padded chair, with fold-down kneeler attached to the chair in front, was quite comfortable. The usual greeting and visiting among friends. The ‘praise band’ were rehearsing. I put ‘praise band’ in quotes because they consisted of a group of elderly men and women nicely dressed in casual clothes – not the ragtag rock group one usually associates with the term. ‘Good morning, everyone. Good morning.’ The pastor went on to explain that the service would begin outside with the blessing of the palms, and that we should all move outside to take part in that. The blessing of the palms employed the customary chants and readings. After sprinkling the palms with holy water, the priest walked about the assembly, sprinkling everyone. He interjected some lighthearted remarks: ‘You there in the back – you’re going to get sprinkled too. I used to sit in the back, and I know all about how to reach the back.’ When he was finished, he said, ‘Anyone not feel blessed enough?’ (He would allude to this lightheartedness later in his sermon.) We re-entered the church singing the customary ‘All glory, laud and honor’ led by a lady playing the flute. Why was I reminded of the Pied Piper? The Holy Bible, English Standard Version was in the pews. No prayer book or hymnal was used; everything was projected. There was a service handout, but oddly it concluded with the Old and New Testament readings – it didn’t include the gospel reading or the communion service. Digital keyboard, flute, drum (I think it was a bongo drum – it certainly wasn’t the customary Plexiglas-enclosed drum set). There were also three vocalists. All elderly, as mentioned above. The missal stand had been placed backwards on the altar – i.e., facing the people as opposed to facing the priest as he stood behind the altar. The musicians’ area was strewn with water bottles and thermos containers. Call me an insufferable fusspot, but there’s no place around the altar for litter. For a contemporary service (and I confess I was fearing the worst) it was surprisingly sober, basically following Rite 2 in the 1979 Book of Common Prayer of The Episcopal Church, with modifications. See above re the blessing of the palms. At mass, we chanted the Kyrie in Greek. The St Luke Passion was read by six people – but not in parts, as is customarily done; rather, each reader took turns being the narrator. In the Nicene Creed we said that we believed in ‘one holy catholic (Christian) and apostolic church.’ Catholic with a small ‘c’ – and doesn’t it mean universal, not Christian? At the exchange of peace, the screen projection encouraged us to ‘greet a few people you don’t know,’ but it was in reality an extended meet-and-greet all around. We recited the Sanctus and Agnus Dei instead of chanting them, but we sang the Lord’s Prayer to a tune I had not heard before, all holding hands (which I don’t like to do and so I didn’t). We received communion Catholic style – i.e., standing in front of a stationary eucharistic minister to receive the host, and then moving off to the side to intinct in a chalice held by another stationary minister. 10 — Most priests don’t preach a long sermon on Palm Sunday, what with the reading of the Passion and all. But I give the pastor credit not only for preaching a sermon of what was probably his usual length, but also of holding us spellbound for the entire 20 minutes so that we really didn’t notice the time. He did not use notes, but he did glance up from time to time at the sermon outline that was projected on screen. Suffering: why? On Palm Sunday we remember Jesus’ triumphant entry into Jerusalem, which was a fun occasion (and we had fun doing it outside, didn’t we?) But Jesus moved from triumph into a scary place, as does the Palm Sunday liturgy. The city that welcomed him with shouting and singing became a city that turned against him, shouting something quite different. Why do we suffer? There can be no doubt why Jesus suffered, and our suffering too can be not only for the glory of God but also for the salvation of others. God understands why we suffer, and he wants us to learn from it. It is humbling – certainly Jesus, who after all is part of the Holy Trinity, humbled himself. Suffering is a mystery that saves – the Good Thief who was crucified with Jesus knew why he was suffering, and Jesus assured him that such knowledge would earn him salvation. So why do we suffer? So that we may follow in Jesus’ footsteps. I always feel a chill go up my spine when I hear Isaiah 52:13-53:12 read (the suffering servant). Truly inspired, truly Messianic. And followed by Psalm 22 – wow! The entire essence of Holy Week is encapsulated in the Palm Sunday liturgy. As mentioned, communion was Catholic style, so I made like a Catholic (well, some of them anyway) and slipped out right after communion. To tell the truth, I don’t know why. I did have another place to be, but there was plenty of time. As it turns out, I had to wait about 15 minutes for a bus. I didn’t stay. The monthly parish luncheon was mentioned in the handout as taking place that day, but again, I really don’t know why I wasn’t in the mood for staying. 8 — If I were lucky enough to live in Oceanside (I’d have to win the lottery to be able to afford it), I’d seriously consider making Grace Church my regular. 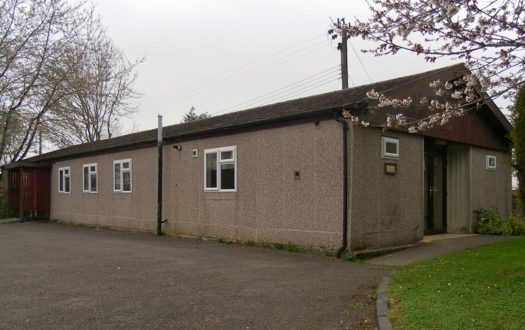 It is a friendly, closely knit, family style congregation, very welcoming. They take their liturgy seriously but are not afraid to lighten it up a bit here and there. The preaching is excellent. The music – well, I don't know; I'd have to see what their traditional service is like. I do visit Oceanside frequently, and I would be happy to stop in again.